Although the Fc hinge region binding proteins are unrelated at the secondary and tertiary structural levels, patterns do emerge when one compares the detailed atomic interactions made by these molecules. 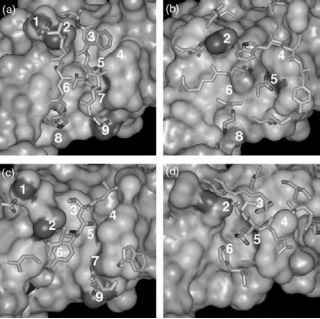 Superposition of the available crystal structures enables identification of a set of conserved molecular interaction sites in the consensus region (Fig. 4). 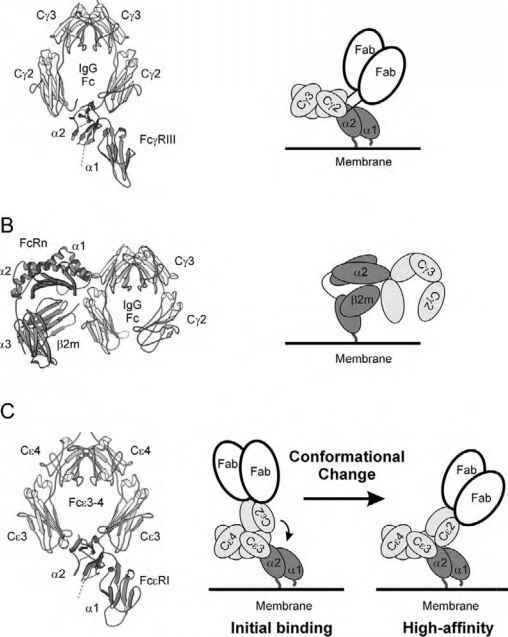 Although the overall folds of each of these Fc binding domains are distinct, there are numerous similarities in the geometric arrangements of the specific functional groups presented by each partner (Fig. 5). binding of many rheumatoid factors is sensitive to truncation of the side-chain atoms in the consensus binding region [11,25]. Binding of protein A is disrupted by alanine substi-tions at positions 253 and 435, and the Fc binding peptide can be blocked by alanine substitutions at 434, 435, or 436 . 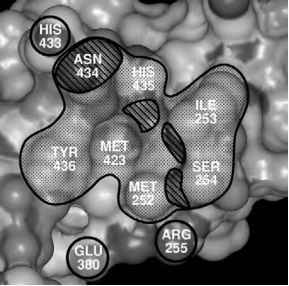 In each case, there are functionally important binding interactions in the consensus region, though the relative importance of individual residues appears to be non-uniform.